If you have children or grandchildren, you probably have wondered what the world will be like for them in 20 or 30 years. Will it be a better place? Will climate change upend their lives? 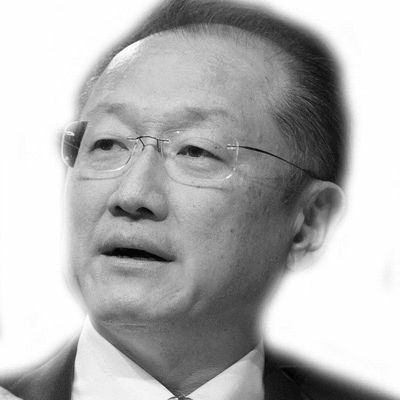 It's something I have thought about a lot since I became the president of the World Bank Group in July 2012. Within my first few months on the job, I was briefed on an upcoming climate change report, and the findings shocked me. I knew then that tackling climate change would be one of my top priorities as the leader of a development institution whose mission is ending extreme poverty by 2030 and boosting shared prosperity. If we don't start controlling climate change, the mission to end poverty will fail. Last week I delivered a lecture on climate change at Georgetown University in Washington, D.C., to a roomful of young people who are surely thinking of climate change's impact on their lives. Climate scientists project that if we do nothing to control carbon emissions, temperatures could rise by as much as 4 degrees Celsius by the 2080s. Mean temperatures during the last ice age were 4.5 degrees to 7 degrees Celsius lower than today, and the temperature had changed gradually over millennia. We're talking about that kind of temperature shift occurring in the future over a very short period of time. Life on Earth would be fundamentally different. Even now we may be experiencing some of the expected effects of climate change: temperature extremes, droughts, floods, and bigger and more violent storms. Over the past 30 years the world has lost more than 2.5 million people and almost $4 trillion because of natural disasters. More than three quarters of these deaths were in developing countries, and almost half of them in low-income countries. Two weekends ago the toll of such disasters was brought home to me as I spoke to an emotional President Baldwin Lonsdale of Vanuatu during the UN World Conference on Disaster Risk Reduction in Sendai, Japan. A category-five cyclone had hit Vanuatu the night before, causing widespread damage. I assured the president that the World Bank Group would help Vanuatu recover. Poor countries like Vanuatu are not prepared for these kinds of shocks. We need to expand the use of mechanisms and systems to protect poor people from disasters and help them recover more quickly. We need a plan for the planet. And the world needs to put the brakes on climate change. But any plan to tackle climate change can't sacrifice economic growth if we hope to end extreme poverty, reduce inequality, and ensure that poor people gain access to energy. We need to decouple growth from carbon emissions. 1. Put a price on carbon. Requiring companies to pay for the carbon they put into the air encourages them to invest in cleaner energy and low-carbon innovation. It is an idea whose time has come. 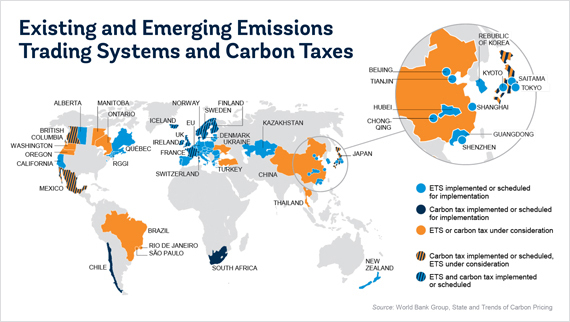 Close to 40 countries and more than 20 cities, states and provinces now have or are preparing to implement carbon pricing through emissions-trading systems or carbon taxes, and their numbers are growing. Last September some 74 countries, 22 states, provinces and cities, and over 1,000 businesses and investors signaled their support for carbon pricing ahead of the UN Climate Leadership Summit. Putting a price on carbon would unleash market forces in the fight against climate change. It is the single most important thing we can achieve in an international climate agreement in Paris in December. 2. Phase out fossil fuel subsidies. With oil prices low, now is the time to phase out fossil fuel subsidies that encourage waste and discourage low-carbon growth. Nearly $550 billion went into direct fossil fuel subsidies worldwide in 2013, taking up large percentages of some countries' GDP to artificially lower energy prices. Yet the evidence shows that fossil fuel subsidies don't benefit the poor as much as the rich. 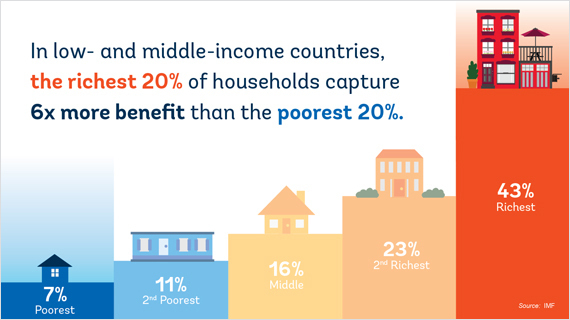 Studies show the wealthiest 20 percent of the population captures six times the benefit from fossil fuel subsidies as the poorest 20 percent. The savings from removing fuel subsidies can be reinvested where they are most needed, including health, education, and other areas that benefit the poor. 3. Encourage energy efficiency and renewable energy. About 1.2 billion people worldwide don't have access to electricity. Renewable energy development will be critical to close this energy-access gap sustainably. Fortunately, renewable energy is becoming increasingly affordable. 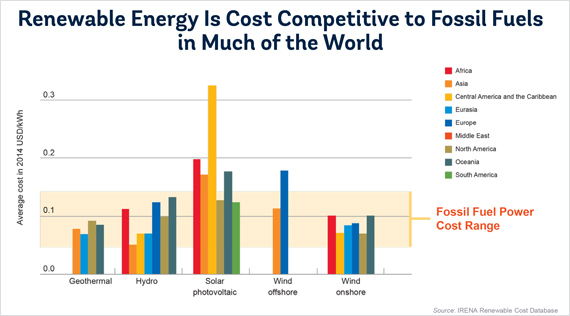 In many countries, developing utility-scale renewable energy is now cheaper than or on par with fossil fuel plants. Energy efficiency improvements are also crucial to reduce emissions. Every gigawatt saved is a gigawatt that didn't have to be produced. Globally, energy use is about one-third lower today than it would have been without the past 20 years of energy efficiency improvements. Cities are growing quickly, particularly in the developing world. 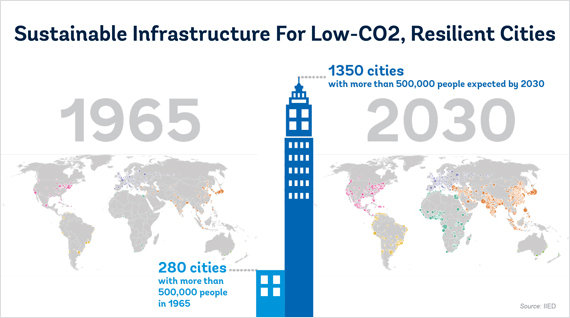 More infrastructure is likely to be built in the next 20 years than in the past 6,000. In Africa and elsewhere there is an opportunity to build cities in ways that avoid locking in unsustainable patterns, while opening up access to jobs and opportunity for the poor. Financing that growth could be a challenge. Data show that only about 4 percent of the 500 largest cities in developing countries are deemed creditworthy in international markets. The World Bank Group is helping cities improve their strategic planning and fix the financial fundamentals that can prevent them from accessing finance. Agriculture, forestry and other land use contributes just under a quarter of greenhouse gas emissions -- and these emissions could grow as the global population hits a projected 9 billion by 2050 and demand for food increases. 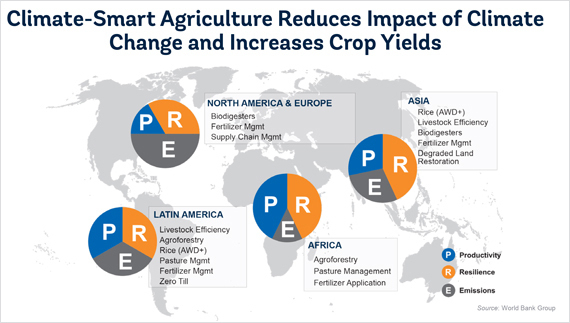 Climate-smart agriculture techniques can increase crop yields, strengthen farmers' resilience to climate change and reduce net emissions through healthy soil and vegetation that serves as a carbon sink. This approach to managing cropland, livestock, forests and fisheries will allow the world to produce more food on less land, reduce emissions, and increase global food security. The graphic below shows approaches our experts consider necessary in different regions. 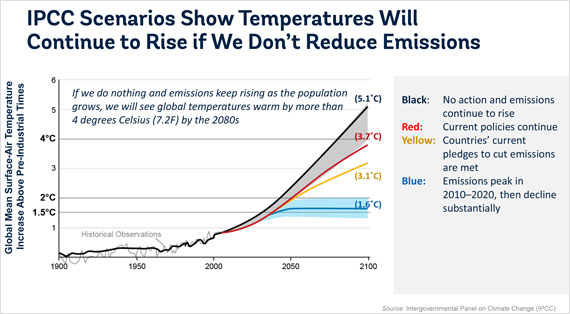 These five areas of action could help the world get off the path toward 4 degree of warming. For our part, the World Bank Group is trying to build climate change considerations into everything we do, because we know that if we don't confront climate change, there will be no hope of ending poverty or boosting shared prosperity. The longer we delay, the higher the cost will be to do the right thing for our planet and our children.